The old saying that you should never judge a whatever by its cover is most definitely proved correct by this, the second album from a Norwegian band formed by ex-members of the unforgettably named burlesque rock band ‘Procosmian Fannyfiddlers’. The cover in question here is a black and white picture of a young girl standing on a desolate hilltop under a leaden sky beside a Calvary-type cross over which is draped a noose, with the band name and album title in Gothic typeface. Add to that the description of the album given in the accompanying press release :- “Abandoned By The Sun is the story of the dubious disappearance of a 15-year old girl, the disappearance securing a downward spiral and a grave ripple effect that threatens to ruin the lives of everyone close to her. Nothing can be worse than losing someone precious without getting any answers”, and you would be forgiven for expecting some screaming death metal misery-fest. Song titles such as Suicidium, Maternal Mortality, and Purgatorial Membrane further reinforce the gloomiest of expectations. However nothing could be further from the truth. Given the undeniably dark and doom-laden subject matter involved there won’t be much tapping of toes going on while you listen to this album, but thanks to the musical and lyrical skill of those involved the story is presented without compromising the fact that it is supposed to be entertainment rather than a penance, and the album never becomes overwhelmingly miserable or depressing. The first track Sudden Dereliction quickly sets a pattern which occurs throughout the album, starting as it does with birdsong and the gentle sound of lapping waves leading into folky acoustic guitar and flute giving way to sombre bass-heavy riffing reminiscent of early Black Sabbath. The use of snippets of various sound effects to preface the songs occurs with great effect throughout the album. The majority of the vocals throughout are very effectively handled by Petter Falk, who keeps things nice and simple and although he, as a non-native English speaker, occasionally delivers a slightly unconventional piece of phrasing it doesn’t detract from his ability to convey the emotional depths of the lyrics. The second track Suicidium changes the mood completely, being a short hymn-like piece sung by a monastic-like choir, and also introduces the voice of guest vocalist and flautist Mette Jensen whose contributions play no small part in the successful mixing of light and shade which distances this album from the average doom metal formula. Exiled Witness then returns us to the guitar-based riffing (think When The Levee Breaks) over an organ backing reminiscent of classic old-school British heavy progressive rock which forms the backbone of the whole album. In fact the overall production feel throughout evokes memories of the early days of prog in the 70’s, which to my old ears is no bad thing at all. The remaining tracks follow the same skilful mix of rock and folk-style instrumentation and vocals which makes this record much more than simply a rehash of decades-old material. I would normally try to reference other similar sounding artists as a guide to those unfamiliar with the material under review, but although there are similarities between parts of Abandoned By The Sun and the music of more well-known acts, when both the subject matter and the musical content are considered as a whole I think this album is pretty unique. 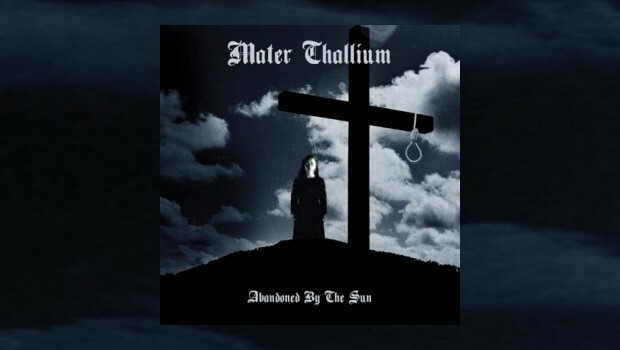 The fact that I have returned several times to Abandoned By The Sun in addition to the necessary ‘reviewing listens’ attests to the fact that Mater Thallium have proved more than equal to the challenge they have set themselves and have produced an outstanding album which I would thoroughly recommend. Hopefully there is a lot more music to come from this band.